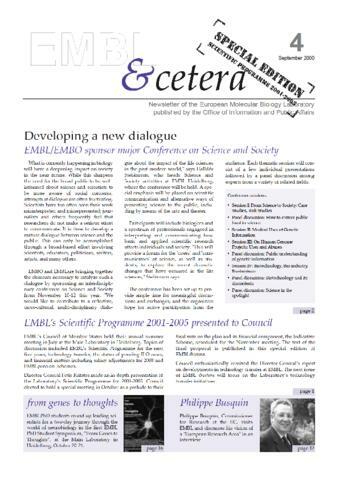 Science & society: Developing a new dialogue: EMBL and EMBO have organized a conference for November 19-12, 2000 to talk about the urgent need to improve the communication between science and society. The conference included biologists, educators, science communicators, and government representatives. Picture of Julian Kinderlerer and Jens Reich. Science Citation Index available on a trial basis: announcement that EMBL is offering this service. Planning EMBL’s future: final proposal of Scientific Programme and Indicative Scheme for 2001-2005 presented to Council. Additionally they will arise ILO cases, Pension scheme and Salary Adjustments. A European research identity: Interview by Russ Hodge of Philippe Busquin who was Commissioner for Research of the European Commission. The EMBL Annual Report and Research Reports for 1999: Announcement that it is available upon demand. From genes to thoughts: Interview by Katrin Weigmann to EMBL PhD students who organized a neurobiology conference. These are Michi Hannus, Freddy Frischknecht, Giuseppe Testa and Valentina Greco. Photograph of organizers.